As specific orders began arriving to the firefighters in Atlanta, a team of 50 Monday morning quickly was ushered onto a flight headed for Louisiana. 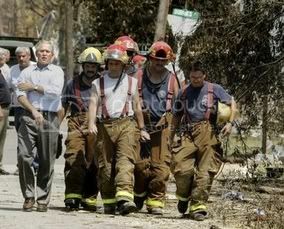 The crew’s first assignment: to stand beside President Bush as he tours devastated areas. I like how he’s rollin up his sleeves, it means he’s going to pretend to do some Hard Work. 1 Comment To "We pause for a quick laugh"
Copyright © 2001-2012 newsrackblog.com. All rights reserved.